Seharti’s bank, the Mulya Jaya Trash Bank, doesn’t deal in cash but in garbage. It’s a concept about as far removed from modern-day big banking as it gets. 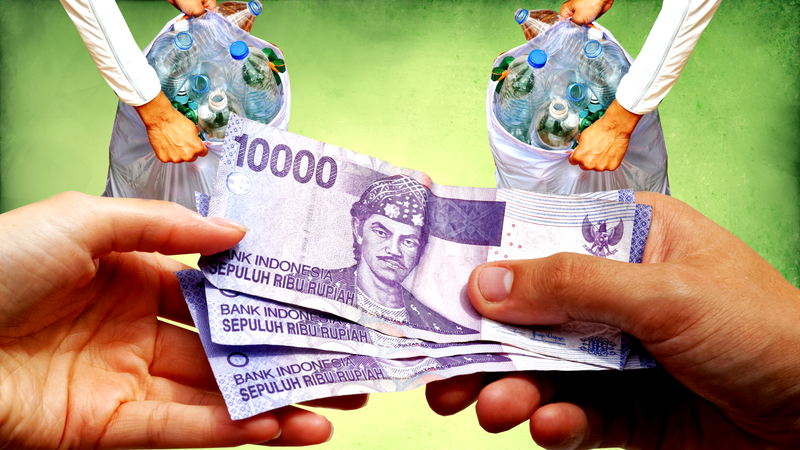 Known in Indonesian as a bank sampah or a trash bank, customers of this financial institution deposit their household trash and withdraw the money earned when it’s sold to local recycling companies. “We (the neighborhood) can earn an extra income doing this,” said Inda Kuwatri, manager of the Mulya Jaya Trash bank, even though her and her employees are unpaid volunteers. She sits at a desk set up on the street in front of the bank’s office, a small nondescript building wedged between busy food stalls. Bicycle rickshaws carrying school children pass, as bank employees, all women wearing teal hijabs, use an electric scale hanging from the concrete awning to weigh the bags brought in by Seharti and the other bank customers. “More importantly, we are raising awareness for our environment, and we are reducing the amount of trash being thrown away,” Inda said. The Mulya Jaya Trash Bank is just one of thousands of trash banks that have popped up in cities all across Indonesia as a grassroots effort to simultaneously combat poverty and the country’s mounting waste problems. The magnitude of both issues can be seen at any one of the overflowing landfills rising up on the edges of Indonesia’s major metropolises—mountains of garbage where scavengers pick out a living foraging through knee-deep waste alongside cows and dogs. “We still rely very much on landfills; 69% of our waste goes to landfills,” Indonesia’s Waste Management Director R. Sudirman told The Jakarta Post last year. That’s lot when compared to the EU, where only 27% of trash ends up in landfills. Not so much when compared to the United States, where 55% of garbage gets dumped. An eleven-year-old works on the mountain of rubbish with other workers collecting plastic, at the Bantar Gebang landfill site, one of Jakarta's biggest dump sites, in 2010. Sudirman went so far as to say that Indonesia’s waste management problems were so dire that he wanted to declare a state of emergency. In this bleak setting, trash banks are taking off. According to the Indonesian Environment and Forestry Ministry, there have been 2,800 trash banks established in 129 Indonesian cities over the past decade. These trash banks accounted for 5,551 tons of waste a month. Not just confined to Southeast Asia, similar trash bank systems have sprouted in other developing nations dealing with their own waste challenges—Ghana, South Africa, India, Colombia, and Brazil. Indonesia’s trash bank network is believed to be the largest. "Waste is not waste, but a resource that can generate income for your household." The total amount of trash processed by banks sampahs in Indonesia may be minuscule—about 0.1% of Indonesia’s total waste production—but in the densely populated neighborhood serviced by the Mulya Jaya Trash Bank, residents say they can see the difference not just in the streets and in their homes, but in the attitudes of the people. Employees of the Mulya Jaya Trash bank weigh a customer's deposits. Like many of Bank Mulya Jaya’s customers, this is Soroh’s first savings account. She held up her small bank book where her deposits are recorded in neat handwriting, and pointed to the figures with a knobby finger. It’s not much by Western standards, usually between 30,000-100,000 Indonesian Rupiah or $2-$8 per deposit, but these small sums can make a difference. Other’s hope the money will lead to a brighter future for their children. One customer uses the money to partially pay for her five-year-old son’s education. Another is saving up to pay for her grandson’s wedding. The bank also offers small loans and has programs for customers to pay for their electricity or phone bills, all with trash. Trash Bank coordinator Ayu Andiri looks over the pickup schedule at Bank Bina Mandiri's offices. “We work with the factories and can offer a stable price, that’s what makes us different from the garbage hawkers,” said Ayu Andira, one of the managers at Surbaya’s central trash bank, Bank Bina Mandiri. Surabaya’s trash banks also accept a number of things that traditional recyclers will not accept, Andira explained, including household items like CDs, batteries, used cooking oil, sandals, and even old rice. All of the garbage deposited at neighborhood banks like Mulya Jaya is brought to Bank Bina Mandiri, where it is processed, packaged, and then shipped to local factories. Bank Bina Mandiri was the first trash bank in Surabaya, started in 2012 by three university students and run out of their homes. Today, the bank’s offices are the coordinating headquarters for Surabaya’s 200-plus trash banks and include a large sorting and packaging area, as well as a covered garage for a flatbed truck. It is still run by student volunteers. Andira estimates that approximately 38 tons of trash was processed at Bina Mandiri last year, and she expects that number to grow. Between classes and school work, she visits local schools, offices, and neighborhoods to spread the word and establish new trash banks.